Bill C-92 An Act respecting First Nations, Inuit and Metis children, youth and families has been heralded as a “historic turning point”, an “important first step”, a “major milestone” and other similarly over-used and under-impressive political phrases to describe yet another top-down initiative from the federal government. While the Assembly of First Nations National Chief Perry Bellegarde (AFN) claimed that this legislation was “co-drafted” by the AFN and the federal government, that was not the case. In fact, Dr. Cindy Blackstock confirmed that First Nations did not co-draft the legislation and First Nations were not even permitted to see the second draft before it was tabled. This should be no surprise as Justice Canada does not co-draft legislation with anyone other than the French and English legislative drafters at Justice Canada – this is their long-standing practice. Bill C-92 content is glaring evidence that First Nation experts in child welfare did not hold the pen on this bill. There are many problems with this bill, but the main problem is it does not deliver any of what was promised by the federal government. Prime Minister Trudeau’s Liberal government promised to address the “humanitarian crisis” through federal legislation that fully recognized First Nation jurisdiction in relation to child welfare; that would provide statutory funding; and would eliminate the over-representation of First Nation children in care. If this bill is not substantially amended before it is passed, it will not accomplish any of those important goals. Ultimately, it will be our children and our families on the ground - in our communities - that will pay the biggest price. The fact that the AFN is promoting this bill so strenuously, without regard for the numerous and serious concerns raised by First Nation leaders, lawyers, academics and child welfare experts, shows how disconnected they are to the crisis at hand. Despite the many issues raised by the Assembly of Manitoba Chiefs, the First Nations Child and Family Caring Society and others, the AFN supports this bill as do the Metis National Council (MNC) and Inuit Tapiriit Kanatami (ITK). While I also have numerous, detailed concerns with the wording, structure and content of this bill, they are too many to include in this blog. What follows is a general overview of my concerns from a First Nation perspective. First of all, pan-Indian legislation has always been difficult to work with because of the differences between the 50-60 traditional Indigenous Nations in Canada that are now separated into 634+/- individual First Nations (Indian bands), across various provinces and within different treaty areas (some without treaties). However, pan-First Nation legislation, with opt-in clauses and flexible provisions to deal with legal, political and cultural variances, would be far superior to what is offered in this bill. Bill C-92 purports to cram First Nations, Inuit and Metis into one act that offers the same legislative options to all three groups – despite their vastly different histories, socio-economic conditions and rights. There are vast differences between the legal rights and specific needs of First Nations, Inuit and the Metis. For example, the Metis have much better socio-economic conditions than First Nations and Inuit. Geographic differences between the Inuit and First Nations and Metis, also require solutions tailored to their unique situation. Failure to do so can create inequalities between the groups. This bill also misses the mark in its purported goal to support Nation-to-Nation (First Nations), government-to-government (Metis) and Inuit-Crown relations by treating us all the same. Here’s the problem – when Canada treats all three groups formally the same, it prejudices the rights, needs and interests of those with more acute conditions. In other words, by treating all three groups as formally equally, those with the most acute needs will be treated substantively unequal. While disadvantage should never be about a "race to the bottom", formal equality will embed discrimination into the very structure of this legislation and will operate to disadvantage First Nations in particular. First Nations are larger in population, have higher rates of child apprehensions and higher rates of underlying poverty, caused by the kinds of land dispossession and breach of treaty rights not experienced by Metis (with some exceptions). That is not to say that the Metis should not have their own framework- that is for them to decide what works best for them with the needs of their own constituency. First Nation, Metis and Inuit options should not be limited to the same generic legislative framework, from the same budget line, which assumes the same socio-economic needs, legal rights and interests. This pan-Indigenous template is not in line with the federal government’s promised “distinctions-based” approach and serves to embed substantive inequality into the act. - Sections 10-15 of Bill C-92, which outlines specific limitations in relation to the best interests of the child, parental representation, notice of apprehensions, preventative care as the priority, and no apprehensions due to poverty. If a First Nation manages to ensure their laws meet all of these conditions, then they could be recognized as a “federal law”, but not a law in their own right – based on First Nation jurisdiction. It seems very clear that what is being offered is a delegated authority under federal jurisdiction, which is also limited by the constitutional division of powers. Nothing in this bill binds a provincial government or requires them to even come to the table - let alone contribute any funding. Some First Nations may be okay with exercising their powers this way in order to address the urgent crisis, but the federal government should just be honest about it and stop trying to package it as First Nation jurisdiction. 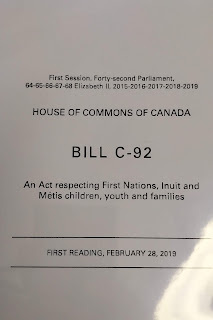 There is also no specific recognition for pre-existing First Nation laws – oral or written – except in the case of self-government agreements, and these laws would only be paramount to the extent of any conflict with Bill C-92. What of First Nations that choose not to make agreements with the province? What if a First Nation chooses to negotiate only with the federal government? There are far more questions than answers in this bill – all of which need to be addressed in order to avoid legal chaos and uncertainty around jurisdiction. My last major concern about this bill is the failure to include clear, directive language that would provide a statutory guarantee for annual funding, that is based on equal access to holistic, wrap- around social programs and services, that take into account specific needs, population increases, inflation, geographic location, and actual costs. Without this statutory guarantee, any recognition or First Nation jurisdiction is entirely hollow. Substantial funds are required for the development and enforcement of First Nation laws, policies and regulations in relation to child and family services; staffing and training; infrastructure; legal and technical research and advisory services; data collection and analysis; and monitoring, compliance, reporting and enforcement. The core issue has always been the long-standing chronic and discriminatory under-funding of social services for First Nations, like food, water, housing, health and education. This racist under-funding is what created the crisis and serves to maintain. Legislation is not needed to end discriminatory funding, but if legislation is to be enacted, a firm commitment for funding needs to be included. It is noteworthy that there is no mention of First Nation Aboriginal rights or treaty rights in relation to the funding that attaches to child welfare. While it may be politically expedient to create an act that is neutral on “rights” for all parties, this must be in exchange for a substantive, enforceable legal funding commitment. Long gone are the days where First Nations can reasonably or responsibly rely on the word of Ministers to hope that they fulfill their political promises. Ministers change, governments change and the law changes – which is why, if there is to be legislation, that it include a statutory guarantee of funding. Without it, this legislation is empty of any real intention or ability to end the status quo – a price that will continue to be paid by our children and their children. First Nation cannot afford to lose any more children to a racist and sexually violent system that decreases their life chances and limits their ability to enjoy life with their families, communities, and Nations. The increasing foster care rates, incarceration rates and murdered and missing rates compel us to act urgently and with purpose. All that is required is for Parliament to sit down with First Nation child welfare experts and make the required amendments. Without substantive amendments, this bill may end up causing more harm than good and inject legal chaos into an already broken system and risk the lives of more of our children. Canada has apologized for the trauma caused by residential schools, while at the same time admitting that child welfare has continued the trauma. Canada has stated that this is a humanitarian crisis and as such is legally and morally bound to do better. It’s time to sit at the table and urgently work this out for the sake of the children.